When the ancient Greeks and Romans had a question of great import, they traveled to the navel (omphalos) of the world, which they believed to be at Delphi, on the steep slopes of Mount Parnassus in Greece (see map below). Mount Parnassus was Apollo’s mountain — the mountain of wisdom and music, the place where Apollo had given Orpheus his lyre and taught him to play it, a place that other artistic places (such as Montparnasse in Paris) still try to evoke today. Because Apollo could see the future, he would have the answer to any question, here at his temple. And he gave his answer through a woman, the Pythia (pictured above). She would sit above a chasm in the rock through which the god sent vapors (pneuma) that put the woman in a trance. Thus possessed, the Pythia would babble, and priests were at hand to transcribe her words into beautiful hexameter which they gave to the individual who had asked a question. The answer was coherent syntactically but not necessarily substantively. 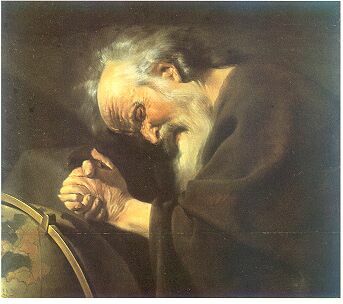 You recall that both King Croesus and Socrates, for example, had received answers from the Pythia that were ambiguous at best (disastrously so, in Croesus’ case). But nobody could dispute the power of the god, or rather of his vapors. And that remains true even today. The vapors are real, it turns out. Mount Parnassus sits atop several very active faults. The earth below constantly rubs and often quakes, grinding the rock until it emits … vapors. Which vapors? Methane and ethane, apparently. Even the spring water at the site contains ethylene. 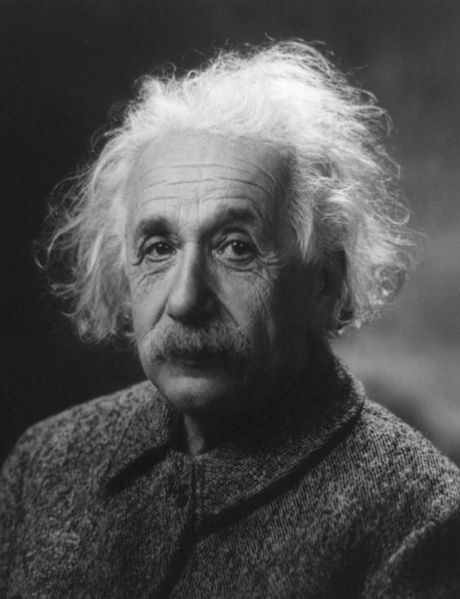 In short, even the scientists who go there today, if they hang out there long enough, if they inhale and ingest, may enter the trance of the Pythia and receive the ambiguous wisdom of Apollo. And so mythos and logos meet; and ‘Socrates’, Dionysus and Apollo become one. Alexander the Great was busy conquering the known world once, when he saw, on the banks of the Indus river in today’s Pakistan, a naked guy sitting in the Lotus position and contemplating the dirt. “Gymnosophists” (gumnos = naked, sophistes = philosopher) the Greeks called these men. We would call them yogis — as in: Patanjali, say. “What are you doing?”, asked Alexander. “Conquering the world,” said Alexander. Then both men laughed, each thinking that the other must be a fool. Devdutt used to be successful and bored (the two can go together) in the pharma industry until he decided instead to make a living out of his passion, which is comparative mythology, by applying myths and storytelling to business. Wow. That’s exactly what The Hannibal Blog (at least in part) tries to do. But let’s get back to this specific little anecdote (which echoes another such encounter Alexander was said to have had). It makes a perfect transition in my thread on heroes and heroism from the Greek and Roman heroes of antiquity to the Eastern heroes of antiquity. make it count by being spectacular! The yogi grew up on up on different stories — the Mahabharata (which I love) and Ramayana and so forth. His heroes, such as Krishna and Rama, were not distinct individuals who lived once and made it count, but different lifetimes of the same hero. stop wasting your time by conquering things that have been and will be conquered countless times, and try to see the point. In my last post on Aeneas, I argued that he was “the first western hero whose internal journey is as important as his external journey.” Well, I put the word western in there for a reason: Because I was already thinking of Arjuna, to whom I must turn in a separate post. Today, a story about trust — the need for it, and the horrible consequences of losing it. The lesson comes wrapped in the myth of Orpheus. So far in this evolving thread on heroes and heroism, I’ve looked at the brute archetype of a hero (Hercules), the more refined classical archetype (Theseus), and a more complex and ambiguous hero (Jason). 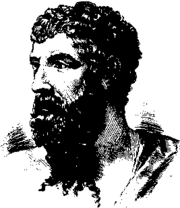 They were all not only Greeks but also Argonauts — ie, they boarded the ship Argo to accompany Jason on his quest to get the Golden Fleece. The main purpose of that ship, besides conveying Jason on his quest, seems to have been precisely that: to establish who did and did not count as a hero. Therefore it is clear that the Greeks considered Orpheus, also on board, a hero as well. And thereby the pattern of increasing complexity in the idea of heroism continues. Orpheus, I would say, was the first “romantic hero” in the history of storytelling. Who was Orpheus? A Wunderkind. He had the best singing voice in the world, the best musical ear, the most sublime talent for moving humans (and even animals and trees and rocks) with sound. He may have been the son of Apollo, the god of (among other things) music, and Apollo personally taught Orpheus to play the lyre. Whenever Orpheus filled the air with sound, nature relented and sighed and swooned. That’s the first sign that he was a romantic hero — he was not known for his strength, as Hercules was, but for a talent. Nonetheless, he was also brave, or at least bold. But his heroism had a different motivation. Orpheus did something heroic not because he could (Hercules) or because he had a public duty (Theseus) or because he wanted to reclaim a throne and power (Jason) but because he … loved. He loved a woman named Eurydice and they married and lived in bliss. But one day (her wedding day, in some versions), Eurydice was walking through a meadow when a venomous snake bit her. She died and went to Hades, the underworld of shadows. Orpheus was inconsolable. He decided that he could not live without Eurydice, so he set out to do something very bold: He went down to Hades, as a living human visiting the dead, to plead with Hades to give Eurydice back. To get down there, he used his talent. When Cerberus, the huge three-headed dog who guarded the underworld, blocked his path, Orpheus sang so sweetly that Cerberus wagged his tail and let him pass. When Orpheus reached the dark and stinking river Styx, he sang again and Charon, the ferryman, was moved to bring him across. And so he arrived among the ghosts and shadows of the dead, keeping fear at bay by thinking only of his beloved. He appeared before King Hades and his queen, Persephone, and there sang and played his lyre more beautifully than he ever had before (pictured above). Persephone in particular was moved that a man could love a woman so much, and Hades, also touched, relented. He would give Eurydice back to Orpheus — ie, make her alive again — on one condition. That condition was simple: Eurydice would follow behind Orpheus up to the world of the living, but Orpheus was not to turn around to look at her. So she was called and Orpheus began the long way upwards toward the surface of the earth. He could not hear footsteps behind him, but of course he knew that Eurydice was still a shadow and had no weight yet. Orpheus kept climbing and looking forward with determination and focus. At last, he saw the first rays of light at the top. But doubt seized him. What if Eurydice was no longer there? What if she had never been behind him to begin with? Orpheus forgot himself and … turned. And as he turned, he got one last glimpse of his beloved. Eurydice had indeed been behind him all this time, just as Hades had promised. But now, because Orpheus had turned, she dissolved back into the darkness. With a look of unbearable sadness in her eyes, she returned to Hades — this time forever. So Orpheus returned to the world of the living alone. But who calls this living? He was a broken man. His songs and music were henceforth desperate and made animals and plants cry. Eventually, a group of women (or nymphs or beasts) who could not bear it anymore tore him to pieces and threw his lyre and body parts into a river. 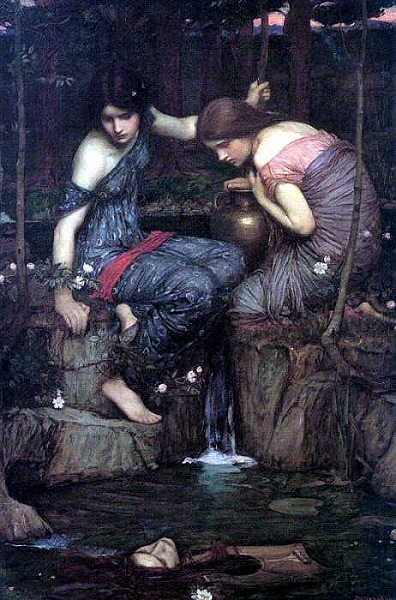 Nymphs (above) saw Orpheus’ head floating downstream, still singing its mournful song of love bereft and trust betrayed. Perhaps his shadow, when it arrived in Hades, found Eurydice’s at last. You may know it as the story of the Golden Fleece, or of the Argonauts, but it is really the story of Jason and Medea, arguably the most haunting couple of all time. With that story (even though it appears to be as old as those of Hercules and Theseus), the Greeks, in my opinion, took a leap into complexity, subtlety and even modernity in their depictions of heroes and heroism. In this thread on heroes so far, I called Hercules the brute and primal archetype of a hero and Theseus the more sophisticated classical archetype. And Jason? He would have to be the first “anti-hero” as you might find him in Film Noir. As you read my (admittedly editorialized) re-telling of Jason and Medea’s story below, see if you recognize those noir-ish aspects, and reflect on some of the other issues that have come up in the comments to this thread so far, such as whether heroes have to be “good” or “altruistic” to be heroic. As usual in the Greek myths (see Theseus), our hero is the son of a king. And as usual, there is some tension surrounding the throne. In this case, Jason’s evil uncle, Pelias, has usurped the throne from his brother and killed all of his nephews so that none can contest the throne in future. He is nervous because an oracle has warned him about a man with one sandal. Jason is the only nephew who has survived. His mother has smuggled him into the wilderness, where the wise centaur Chiron educates him. So we have a cast of archetypal characters: the evil oppressor, the young hero, and even the archetypal mentor, in the form of Chiron, who was also the tutor of Achilles and many other heroes. And we again meet the goddess Hera, whom we last saw when she tormented Hercules because she hated him so much. This time Hera hates Pelias, the evil uncle, and wants to help Jason. She tests him by appearing to him as an old woman, asking to be carried over a gushing stream. (An early appearance of chivalry as a heroic concept in history?) Jason carries her across, but loses one sandal in the river mud. Jason arrives in Iolcus, the city where Pelias now reigns. Pelias sees that the stranger is wearing only one sandal and knows what’s up. Pelias throws a banquet for Jason and — in one of these scenes that are so often implausible in the Greek myths — offers to give up his throne if Jason succeeds in stealing the famously valuable hide of a supernatural ram: the Golden Fleece. Pelias considers the task impossible, and yet, we wonder why he does not simply kill Jason on the spot. In any case, Jason now knows what he must do. Jason is in Greece but the Golden Fleece is in barbarian Colchis (modern Georgia), on the other side of the Black Sea. So he must sail treacherous waters and needs an unusual boat. The Argo is built. The goddess Athena herself (in league with Hera, who wants to support this quest) donates for its prow a wooden plank that can foretell the future. Jason now has to assemble a crew, and not only Hercules and Theseus but all the great Greek heroes become his shipmates. (If you’ve been reading my posts on Hercules and Theseus carefully, you might already have noticed that the implied chronology is impossible. But the Greeks were not worried about technicalities.) The point of this gathering, I believe, is to prove to us that Jason is indeed a hero — that he can assemble the other heroes, that he is their equal by association. Off they sail, these Argonauts, and encounter the usual heroic adventures and dangers — rocks in the sea bashing passing ships to pieces, and so forth (compare Odysseus). I will skip over these, except for one subplot that may amuse those of you who share my opinion of Hercules. Hercules is, of course, the strongest Argonaut — the best rower and all that. This means he cannot stay in this story because he would eclipse Jason and take over the whole plot. So we must get rid of him. How, in terms of storytelling, might we narrate him out? Easy: Hera will drive him mad once again. Here is how: Along the way, the Argo pulls into port and Hercules’ lover (yes, indeed) Hylas goes to fetch water from a spring. Hera makes the nymphs in that spring seduce Hylas by drawing him down, never to be seen again (picture below). Hercules goes mad and runs around the forest smashing things and people (in other words, staying in character), and the Argo is forced — regrettably, you see — to depart without him. So the Argo arrives in Colchis where Jason demands that its king, Aeetes, hand over the Golden Fleece. Aeetes would not dream of it, of course. But Aeetes has a daughter named Medea. And just as Ariadne, King Minos’ daughter, fell in love with Theseus and helped him to achieve his quest, so Medea now falls in love with Jason (Hera asked Aphrodite to help). Madly in love. So in love that it will get creepy. Aeetes, like Pelias, gives Jason a dare. He will hand over the fleece provided that Jason harness two fire-breathing bulls to plow a field. The bulls would kill Jason (whom we may infer to be somewhat hapless and not altogether heroic sui generis). But Medea, who is a sorceress, mixes a salve for Jason (pictured at the very top) so that he becomes invulnerable. Jason thus succeeds in harnessing the bulls and does plow the field. But when he begins sowing, it turns out that Aeetes has given him dragon teeth instead of seed. Out of each tooth a warrior sprouts, and this impromptu army is about to kill Jason. Again, Medea comes to his rescue, suggesting that he lob a rock at one of them. The newly-sprouted soldiers do not know who threw the rock, and fight and kill one another. Jason has survived again, but Medea, who is now wholly on his side rather than on her father’s, finds out that Aeetes will renege on on his pledge and refuse to hand over the Fleece. So, at night, she leads Jason to the sacred grove where the fleece is nailed to a tree, guarded by a dragon. Again, it is Medea, not Jason, who overcomes the dragon — she bewitches it and puts it to sleep. The two of them and the other Argonauts at once set sail and flee. Aeetes, when he wakes up, sets off in hot pursuit. If you ask me, the story only begins to get interesting from this point onward. For Medea, and later Jason, will now begin to make bad choices. They will transgress, take things too far, become corrupt. Medea has taken her younger brother Absyrtus with her on the Argo. She now sees Aeetes’ fleet catching up. She has an idea. If she kills Absyrtus and throws him overboard, her father must stop to pick up the body, give his son a decent burial and mourn. She does exactly that. She murders her own brother so that she and her lover can escape. This is too much, even for the gods and goddesses who were on Jason’s side. The gods send storms to punish the Argo. Athena’s speaking prow tells Jason that they must find the sorceress Circe to be purified of their sin (the same Circe whom Odysseus will later meet). 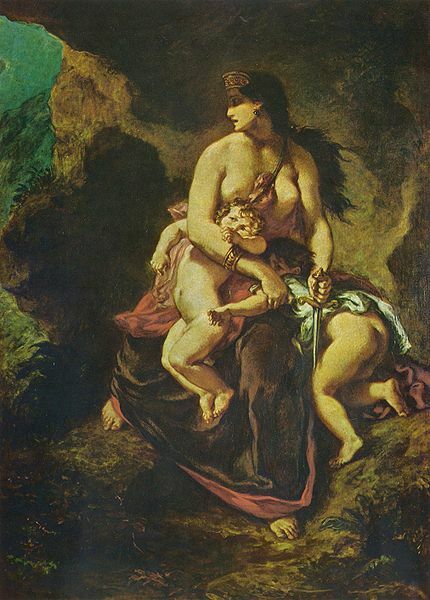 Circe, as it happens, is Medea’s aunt. She sacrifices to the gods so that Medea and Jason can be forgiven for their sin. Absolved, the Argonauts continue their journey (past the same Sirens and Scylla and Charybdis that Odysseus will have to pass). They finally arrive at Iolcus, where King Pelias is already waiting with a plan to kill Jason. Again, Medea takes charge to save her lover. She goes alone to Iolcus and claims that she is a witch who can make old people young again. King Pelias hears about this and asks her for a demonstration. Medea requests the oldest ram in the king’s herd, puts it into a caldron, mixes some herbs together and out comes a young lamb. The king is thrilled and wants the same treatment. Medea tells him that only his own daughters can administer the rejuvenation. So the king’s daughters — Jason’s cousins — boil water in the caldron. Medea gives them herbs, but makes sure they have no magic power. The king enters the caldron, in which his own daughters unwittingly boil him to death. Once again, this is simply too much. The gods and goddesses are outraged at the gratuitous cruelty of the murder. It would have been one thing for Jason to kill Pelias in open battle. But for Medea to make the king’s own daughters kill their father?! The people of Iolcus do not want to be ruled by such a king and queen as Jason and Medea. The couple leave Iolcus and go to Corinth. Perhaps because of Medea’s dark side, Jason has fallen out of love with her. And now he wants to marry a different woman, a Greek and the princess of Corinth, Glauce, so that he can become king of Corinth one day. This is not unheard of — Theseus also dumped Ariadne after she helped him slay the Minotaur. Nor, however, is it heroic. Jason is fickle. He is alive only thanks to Medea, even if she has gone crazy. Our hero gets more complex, more recognizable, more human. Medea now becomes the archetype for “hell hath no fury like a woman scorned.” She sends a beautiful gown to Glauce as a wedding present, but when Glauce puts it on she goes up in flames. Again, Medea has murdered an innocent. But Medea is not yet done. She wants to punish Jason by erasing everything he loves. So she kills their two boys, her own children with Jason. In Euripides’ Medea, she rushes offstage with a knife and the children are heard emitting their final, terrifying scream. Having become vengeance, Medea mounts a chariot and rides off into the clouds. And so Jason’s triumphs, above all his capture of the Golden Fleece, were impostors. He was led astray (the literal meaning of se-duced) by the wrong woman. Then he made things worse by breaking his vow to her, thus losing the respect of the gods and goddesses, even of Hera. He grows old, lonely and bitter. His old ship, the Argo, is rotting on a beach in Corinth. Jason goes there to think about old times. One day, he falls asleep in its shade. The magic prow, put there by Athena, breaks off and kills Jason. So it goes.